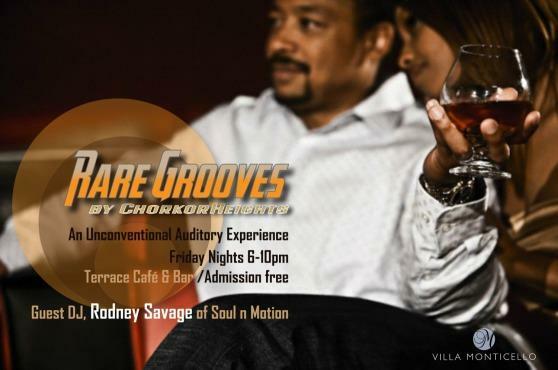 Villa Monticello in conjunction with Chorkor Heights will outdoor a trend-setting weekly event themed “Rare Grooves”, poised to alter Accra’s entertainment landscape by offering an exquisite “warm-up lap” for the Friday night reveller. Rare Grooves entertains guests with carefully selected music typically undiscovered by the regular Friday night venues in Accra. The surprise DJs presented by ChorkorHeights are among the leading disc jockeys found in Accra best known for their foray into the underground world of music. This culminates into diverse selections from trip-hop, jazz, old school hip-hop/r&b, house, trap, soul and afro-beat music. Simply put, Rare Grooves is synonymous with pleasant auditory sensations. Arrive at at the Terrace Bar of Villa Monticello and be spoilt by a wide choice of drinks, refreshing cocktails and a delicious menu offered by serviceable staff in a cozy lounge environment. Be it your romantic date, after-work meetup or a desire for pure sensory indulgence, Rare Grooves is your go-to event. Starts at 6pm and ends at 10pm every Friday. Friday nights will never be the same…. Venue: The Terrace Bar of Villa Monticello. Venue: The Terrace Café & Bar of Villa Monticello, Airport Res. Area (opposite the new Koala). Be there on time to fully participate in this memorable night. Price:Rates US$345-800 double. Rooms 14. This entry was posted in EVENTS and tagged Accra, Arts, CHORKOR, ChorkorHeights, Disc jockey, Entertainment, Friday, GROOVES, Medal bar, Music.